Ombudsman Conchita Carpio Morales has ordered the dismissal from public service of Senator Joel Villanueva for his administrative liability over the allegedly anomalous use of P10 million from his pork barrel allocation as a House member. In a statement on Monday, Morales said the former Cibac representative was found guilty of grave misconduct, serious dishonesty, and conduct prejudicial to the interest of the service. 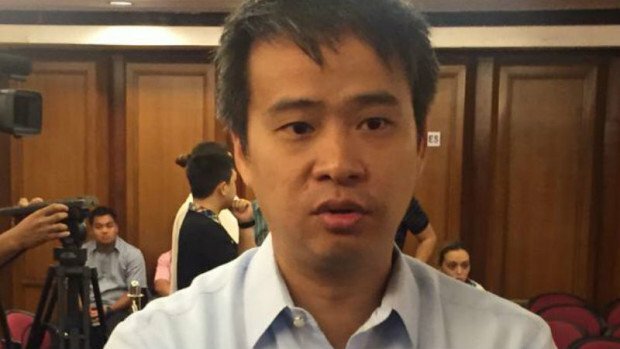 Villanueva's dismissal stemmed from his indictment for malversation, graft and falsification of public documents over the allegedly anomalous disbursement of his P10 million Priority Development Assistance Fund (PDAF) when he was a party-list congressman. Morales said she had ordered the filing of two counts of violation of Section 3(e) of the Anti-Graft and Corrupt Practices Act (Republic Act No. 3019), one count for malversation of public funds and malversation through falsification of public documents against Villanueva and his co-accused. Also indicted were former Department of Agriculture (DA) secretary (now Bohol third district representative) Arthur Yap, Villanueva's staff Ronald Samonte, DA employee Delia Ladera, NABCOR representatives Alan Javellana, Romulo Relevo, Ma. Julie Villaralvo-Johnson, Rhodora Mendoza, and Maria Ninez Guanizo; and Aaron Foundation Philippines, Inc. (AFPI) President Alfredo Ronquillo. Villanueva is the son of Jesus is Lord Church founder Bro. Eddie Villanueva. Villanueva was appointed Tesda Director General with a Cabinet rank by then-President Aquino. He served as Citizens Battle Against Corruption (Cibac) representative from 2001 to 2010. He won as senator in the 2016 polls. According to the Ombudsman, the budget department on June 10, 2008, released Villanueva's P10-million PDAF to a bogus NGO to implement agri-based livelihood projects in Region XI. Two days later, Villanueva requested Yap to release the fund to National Agri-business Corporation (NABCOR) as implementing agency, with the AFPI as NGO-partner. Yap and Nabcor then entered into a memorandum of agreement on June 19, 2008. The items were intended to benefit the residents of the towns of Pantukan, Nabunturan, Tambongon, Bongabong, Napnapan, Mipangi, Anislagan and Magsaysay in the Compostela Valley province. But the transaction was fraught with irregularities, said the Ombudsman, citing information that the localities were not suitable for farming as vast portions of land were planted to bananas and coconuts. No name in the supposed list of beneficiaries was a registered voter or a resident of the province, the Ombudsman added. Local officials also told the Ombudsman that no agri-based livelihood projects were implemented by AFPI. Documents also showed that the bogus NGO AFPI had no financial capability to implement Villanueva's P10 million livelihood project from his pork barrel because it has a small capital stock contribution of only ₱68,000. Ombudsman field investigators also discovered that the supplier, MJ Rickson, could not be located at the business address in Martiniko Street, Malabon City. The supplier was also not licensed by the Fertilizer and Pesticide Authority nor registered with the Department of Trade and Industry. The Ombudsman accused the respondents of submitting fabricated and undated documents to support the "ghost project" such as Accomplishment Reports, Disbursement Reports, Acceptance Reports, and liquidation documents. The Ombudsman said it was informed by the Commission on Audit that the latter has disallowed the P10-million transaction in 2014 due to the anomalies. In his defense, Villanueva alleged that his signatures in the documents were forged. But Morales said "laws and regulations were disregarded by public respondents when Villanueva directly selected NABCOR and AFPI to implement his livelihood projects and the IA officers accepted and accommodated Villanueva by facilitating the processing and approval of the PDAF releases." "NABCOR officers did not even bother to conduct a due diligence audit on AFPI as to its technical and financial capability and simply accepted and relied on the representation of Villanueva and AFPI to undertake the projects in contravention of existing procurement laws," Morales added. Morales cited the Supreme Court decision junking the pork barrel system that lawmakers were responsible for the releases of their PDAF. "In a Congressional Pork Barrel System, it is the legislator who exercises actual control and custody of the PDAF share," Morales said. The Ombudsman ordered Senate President Aquilino Pimentel III to implement the dismissal order against Villanueva.